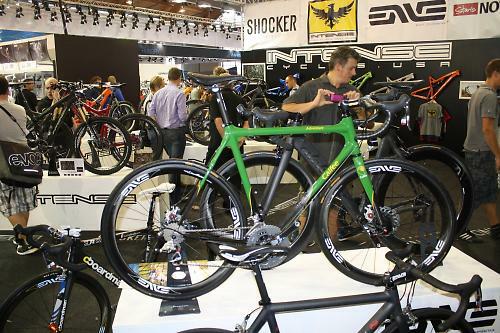 What do you reckon was the colour of the year at Eurobike? Hands-up. Red? Nope. Blue? Nope. Surely not brown? Nah, you're just being silly now. 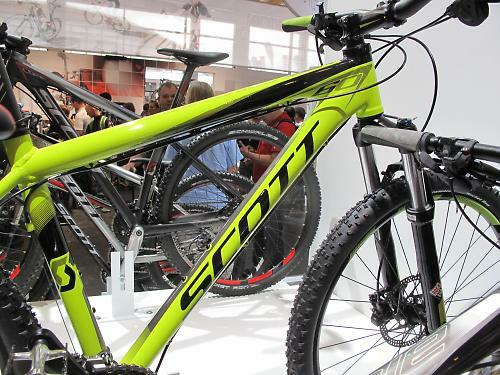 The colour that is set to dominate the bicycle world in 2012 is – wait for it – green. Yep, green. You heard it here first. And if you’re skeptical, we have the proof. It’s right here in our little green dossier. And just to ram the point home we went round and took some video evidence too which we're callingl Un court métrage sur verte… it's about green bikes 'n' that. Just a note on the video in case you're concerned about TR. There was no medical reason for him to be in that wheelchair… he was just tired and borrowed it from one of the nurses on the Muc-Off stand. Don't ask. Anyway, back to the bikes. 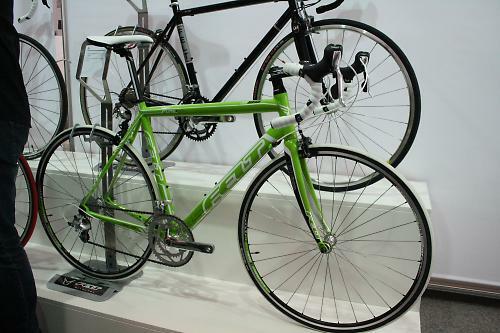 Exhibit number one is the aluminium Felt F95, the entry-level model in the F range and the biggest seller. That’s green alright, but do you know what Felt call that particular shade? Monster green. That has to earn them extra points... If we were handing out green points. Which we’re not. You get matching decals on the Alex R500 rims too. 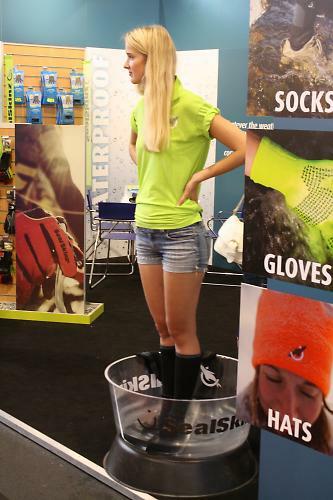 That monster green gets an airing elsewhere in the Felt range. 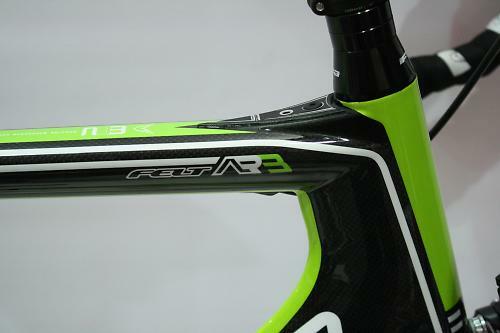 This is the front end of the AR3 aero road bike (which, admittedly, was monster green last year too). They’ve gone for a more subtle approach here. Lless monster, more... pixie. Nice, though – not too in yer face. 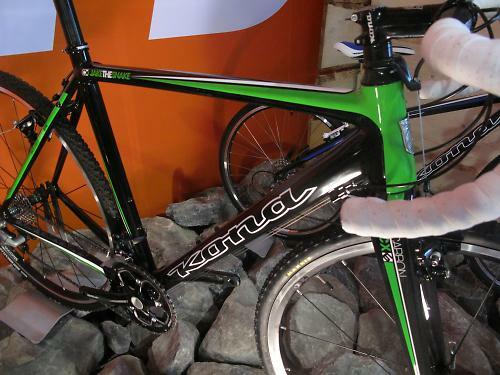 Kona have taken a similar approach on their Jake the Snake cyclo cross bike. Guess what they call that green. Green. A point off for being boring (if we were doing points etc). 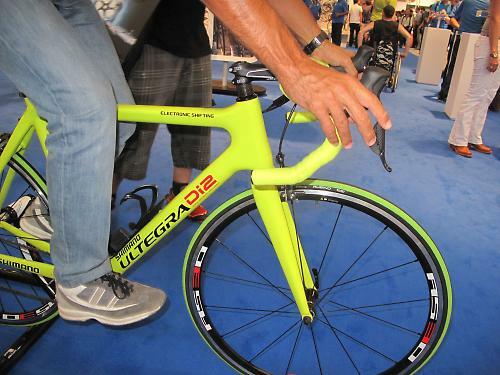 That’s a butted 7005 aluminium frame, by the way, with a full-carbon fork and a Shimano 105 group. If you want to add that particular hue to your life, the Jake the Snake will set you back £1,400. 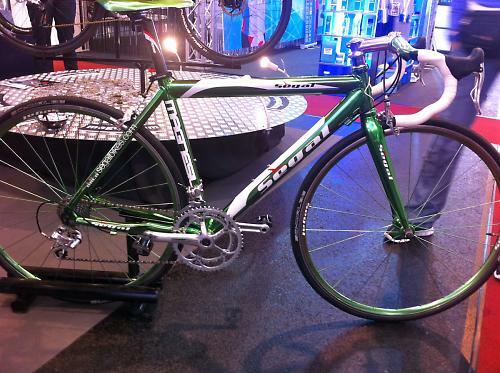 This is a magnesium bike from Segal of The Netherlands and very shiny it is too. As well as the frame and forks, the rims are green too. And the saddle. And the bars. Take it easy there, Dutch fellas; you can have too much of a good thing, you know. Hang on! 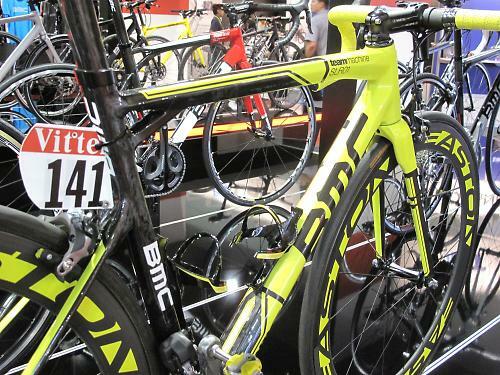 This bike is clearly yellow. It even has Cadel Evans’ number from the Tour de France on the back. They’ve made it yellow to celebrate his win. I don’t care who it belongs to: rules is rules. Out! Ah, now we’re talking. This is more like it. 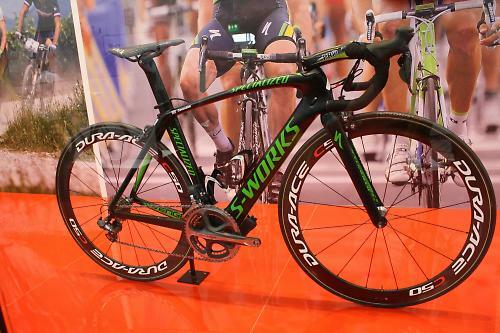 This is the Specialized Venge that Mark Cavendish rode in the Tour de France, with green logos and trim to match his points jersey. See, it all ties together. 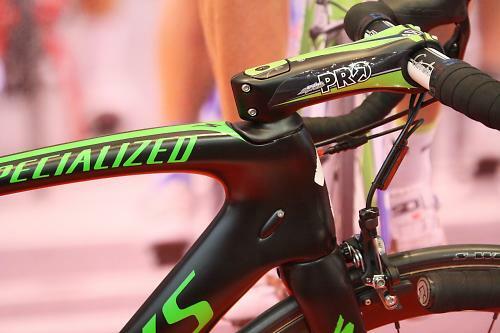 Cav even has green graphics on his humungously oversized Pro Vibe stem. Textbook. More to the point, it has green bits on it, and in this little article that has to be a bonus. This is the Adventure from Calfee Design of the USA. It’s a carbon fibre randonneur – which isn’t something you see every day. You get wide tyre clearance with enough space for full mudguards. Calfee reckon it’s 16.5lb (7.5kg) without guards. 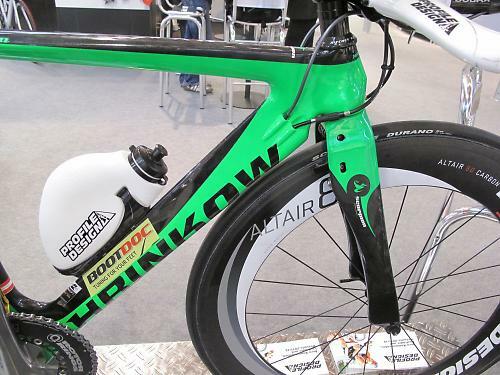 And this is a bike that has been sprayed up by Nokon, the cable people. I’m not entirely sure what that paintjob is supposed to be, but I like it. 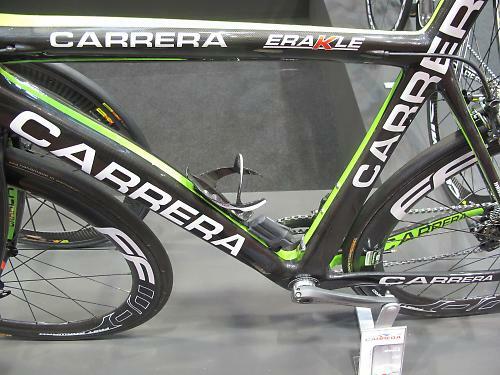 “Can everyone put pictures of green bikes from Eurobike into a folder called ‘Eurobike – The Green Gallery’, please.” I didn’t specify they should be bikes that go on the road but on a website called road.cc, I didn’t think it needed saying. Cyclo cross bikes at a push. I’m not even entering into a discussion on whether this is actually green. But it isn't. Next. 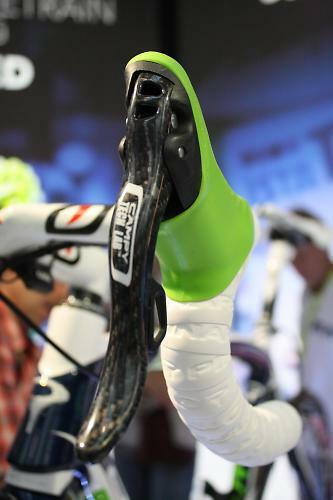 These green lever hoods are on Campag's prototype electronic groupset aboard a Team Movistar Pinarello. 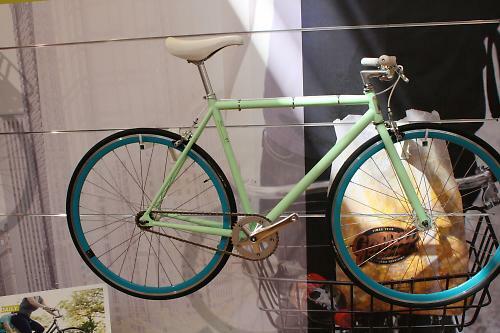 If you want to get on trend and green up your own bike, check out Hudz at i-ride. Mind you, if your frame is red, that’s going to look a right train wreck. Probably best you go with red Hudz to match. Right, a quick look at some green threads. 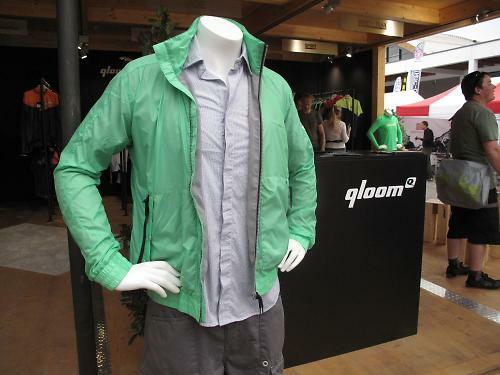 Hang on, is this brand really called Gloom? Oh, Qloom. Either way, it’s odd... as is that mannequin's pose. 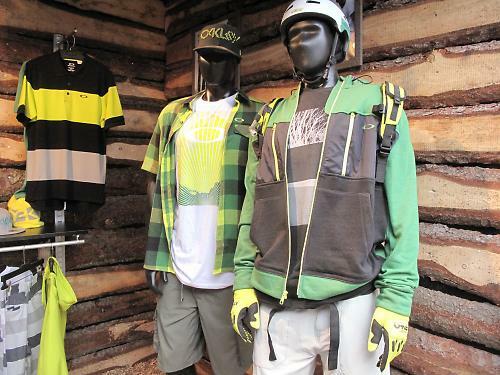 Oakley are getting fully into the green thing. There’s a lot going on with this hoody. Too much, arguably. And finally, last but by no means least, here’s someone in a green shirt standing in a bowl of water while trying to look nonchalant. Brilliant. We need more of this. 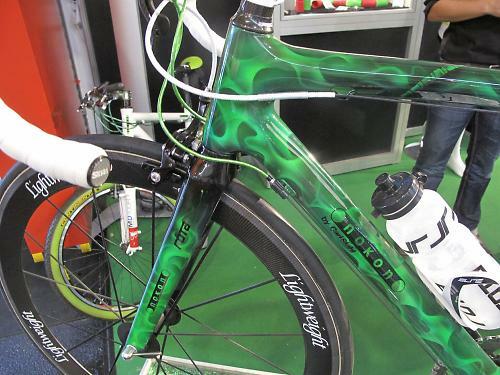 Like most other green things, our green gallery will keep growing cos we've got plenty more pics of green bikes 'n' bits and bobs to work our way through yet.